Yesterday, my brother drove me to the Bureau of Internal Revenue (BIR) in Calasiao to pay the capital gains tax of the land bought by our church. We arrived at the office past 10 AM. The BIR examiner who checked the documents that I showed her told me that I have to pay a late registration fee of our church in the amount of P1,000. Our church was registered at SEC last October and I didn't know that I should have registered it right after that at the BIR. Then she computed the tax that I have to pay but she told me that I have to submit the original land title and an acknowledgement receipt from the seller. I have to apply for a TIN of our church too before I can register it. It took me all day long just to wait for the papers to be signed by all those signatories. The reason why it took a while to wait is that those signatories went out somewhere and they came back to the office late. It really pissed me off because the government is paying their salaries but they're not doing their job well. Kung sino pa ang mataas ang puwesto at malaki ang suweldo sa gobyerno, siya ang palaging wala, kainis. They let the people wait that long for their services. When it's time to pay in the counter, the line was too long. The people were already complaining why they have only one cashier. It was almost 4 PM when I was done with our church's registration and the guy told me to go back next week to get the certificate. I also have to submit the required documents so I can pay the capital gains tax. Imagine the time I spent at the BIR yesterday, almost 6 hours. Not fun at all. But I had to remind myself that I am doing that for our church so we can transfer the land that we bought to the name of our church. It's a good thing that hubby and Vernice decided not to go with us or else they would have been bored to death. Next time when I'll go to their office, I'll see to it that I will write my comments and complaints and drop it in their comment box. I just want to make a review about the foods that we ate at Kultura Splash Wave Resort. I ordered rice and grilled bangus, clubhouse sandwich and chicken barbecue for hubby. My brother ordered barbecue chicken and rice. For our drinks, hubby got bottomless iced tea, pineapple juice for me and regular iced tea for my brother. For dessert, I ordered 3 fruit salads. We were already starving when the waiter gave our foods. He delivered it to our cottage. Hubby's clubhouse sandwich tasted good and also the grilled bangus. The chicken barbecue didn't taste that good. Hubby didn't finish his chicken. When hubby needed a refill of his iced tea, the waiter is nowhere to be found. My brother had to ask the guard to call the waiter for hubby's iced tea refill. It took a while before hubby got his tea. If you want to go there in Kultura and you're in a group, better bring your own food and just pay the corkage fee rather than order their foods because it take them so long to serve your foods. Not a good thing especially if you are already starving. It's summer time once again and one way to beat the heat is going to the beach or resorts. When we went to Pugad Adventure last month, we passed by Kultura Splash Wave Resort so I really wanted to go and see that place this summer. Last year, hubby and I didn't go to any resorts or beaches because of financial constraints. This time, the Lord has blessed us so we decided to go swimming at Kultura. I asked my youngest brother to drive for us since hubby didn't feel like driving. Kultura is located in Cares, Pugo, La Union and more than an hour drive from our place. We didn't bring any foods except some chips and bottled water because foods and drinks are not allowed inside the resort. If you will bring in foods, you have to pay Php50 per person as corkage fee. That's a crap. They do anything to get your money, huh! When we reached the place, we parked our car at their parking area and went straight to pay to the receptionist. The entrance fee is Php250 per person and the nipa hut rent is Php1000. Hubby paid a total of Php1,750 for the three of us. The receptionist asked if we're bringing in foods but I said no so one of their waiters followed us to our cottage and he gave us their menu. While waiting on our foods, I went to take some photos. The resort is very nice. The water park has two Dolphin pools; giant slides; three kiddie pools; air conditioned villas; dining areas offering American, Australian, and Filipino cuisine; a convenience store; pharmacy and clinic; souvenir shops; picnic umbrellas and sheds; and plenty of parking space. The landscape was done artfully and colorfully. The resort focuses on culture and arts. You can see murals and artwork in the resort and there's even a replica of the Sagada cave at the edge of the wave pool. The place is ideal for family outings, meetings, weddings, conferences – or simply for relaxation. Well, it took more than an hour to wait on our orders. Other customers were already bored waiting on their foods. We were almost starving when the waiter gave our foods. After we ate our lunch, we went to swim in the pool. Since it was not a weekend, there were not a lot of people in the resort. It was good, the place was not crowded but the drawback is that they don't open the electronically operated wave pool if there are less than a hundred customers in the resort. So we just had to swim in their regular pool. We went to take some photos in the kiddie slides and you can smell the chlorine in the pool, so strong, unlike in Pugad, you don't smell chlorine at all. That's the reason I didn't stay in the pool that long because of the smell of the chlorine. I had to go shower and changed clothes while hubby and my brother went to try the higher slides in the other pool. After swimming, hubby's eyes were so reddish maybe because of the chlorine in the pool. Hubby and my brother went to shower and after they changed clothes, my brother and I went to take more pics while hubby stayed in the cottage. Then we paid our restaurant bill and we headed home. 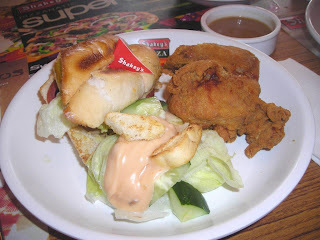 Okay, this is a late post because we dined at Shakey's Urdaneta last week. I just want to make a review of this restaurant which we always frequent whenever we go to the mall. One reason we always want to go there because hubby likes their food and on top of that, this is the only restaurant in the mall which accept debit or credit cards. Most of the time, hubby and I don't have enough cash so we use our debit cards. Hubby also have his Shakey's super card so he gets 10% discount in our bill. The only drawback in this restaurant is that they charge 9% service fee that's the reason hubby stopped giving tips to the waiters/waitresses. Shakey's in Dagupan don't charge us a service fee when we ate there. 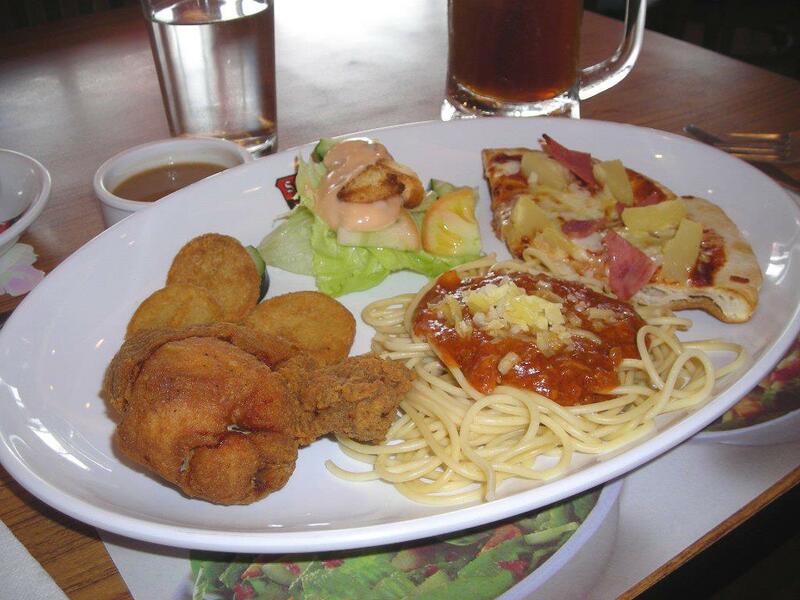 My favorite meal here is the Bunch of Lunch while hubby love their Super Platter. This time hubby ordered the hero sandwich meal and also their vegetable salad. He found out that hero sandwich is really yummy and I like it too. This now became his favorite. As of this writing, hubby and my brother just came home from the mall and he ordered the hero sandwich meal again. Hubby always order the bottomless iced tea every time we dine there because he like the taste, not too sweet unlike in the other fast foods, too sweet. Today, he said their iced tea tastes like syrup.